Free airport transfer (one way) when you book our apartment for 5 days or more. Our modern apartment is located on the third floor in Angel Plaza in the heart of the city and in the centre of events. 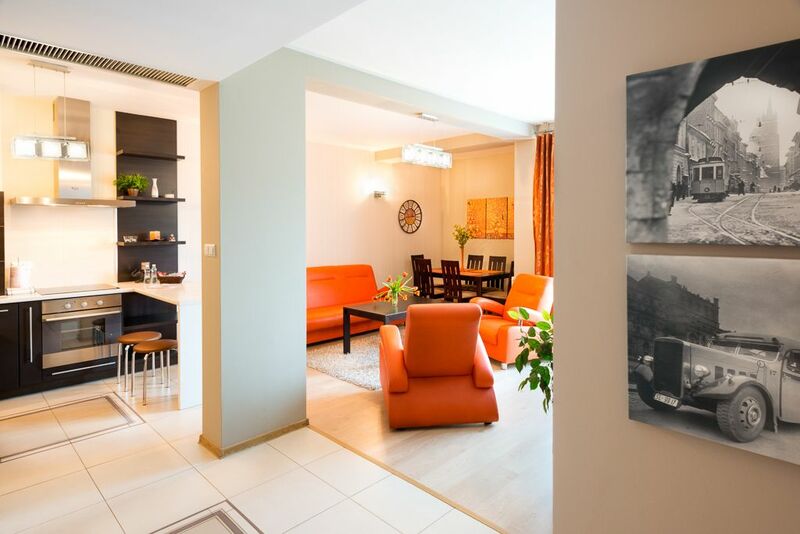 The location of this apartment gives you an immediate access to culture, business, restaurants and entertainment offered by the Royal City of Cracow. Only 5 minutes walking distance from Wawel Castle and Market Square. The building consist of silent-running lifts, underground car parking, 24 hours security and reception, fitness centre, sauna, and Jacuzzi. All rooms are air conditioned and developed with top quality finishing in a modern style. There are two bedrooms: master bedroom with a queen bed and the second room with 2 single beds. Also, there are two full bathrooms: one bathroom has a bathtub and the second a shower cabin. Living room has a convertible sofa where two people can be accommodated. Fully equipped kitchen with all high standard equipments, dining area for 6 people and breakfast table. Perfect location to enjoy all the attractions Krakow Old Town can offer! A five night stay in Krakow which began with a complimentary taxi ride from the airport. The ride to the apartment takes between 20 and 30 minutes and costs 90 zloty. Dorota is an amazing host; she kept me informed before during and after the stay to ensure everything was to our satisfaction and that we made the most of our stay. The apartment is perfectly located with only a 10 minute walk to the main square and less than five to be sat alongside the Vistula river overlooked by Wawel Castle. Immediately opposite is a 24 hour and well stocked grocery store. Only 20 metres from the apartment entrance towards the river is Sette, a pizza restaurant at night and a buffet breakfast cafe in the morning between 7 and 10 costing only 30 zloty per person. The number 2 tram stops a short distance from the apartment at the Jubilat supermarket, walking left from the apartment. Catch this tram to get to the lovely walk up to the mound. The views from the top are worth the walk and the history well delivered by information boards. We chose to purchase three day Krakow Cards which gave us unlimited access to public transport and many of the historical sites. We took Dorota’s advice and used Aushwitz Tours to visit both Aushwitz and Birkenau. Our driver Bartak was a really good driver and a nice young man. The day was clearly sobering but we considered essential to the memory of those who suffered so much. We also visited the Salt Mines which we all enjoyed. There is a long descent down 800 steps but thankfully there is a lift for the trip back to the surface! Quite a lot of walking underground but well worth the effort. You’re underground in spacious tunnels with your guide for about 2 hours. The main square is the place to sit and watch the world go by and take in the architecture of the buildings. There are many restaurants and cafes and a visit to the church of St Mary is a must. There are roads off each corner of the square and to explore these is a delight with many exciting surprises around every corner. The Philarmonic concert hall is a short walk from the apartment and had performances every night we were in Krakow. We ate most nights in a Georgian restaurant at the SW corner of the main square. They served a variety of delicious meals and the staff were very welcoming. To end this review I would like to say how the apartment suited our needs admirably. Very comfortable and spacious. I highly recommend a stay here. From start to finish this was a very easy booking experiance. Dorota kept us updated with the property details and how to get in and get any help if we needed it. Agnes was at the property when we got there and showed us around the apartment.. The apartment was spotless and had everything in it we needed for a long weekend away. The location was fantastic and only a 10 min walk to the main square with all the restaurants and bars. Outside the apartment were a few lovely little cafes for breakfast and some shops for some food and drink. Overall a beat weekend and great place to stay. Awesome apartment in a wonderful location right in the centre of the historic old town. Great service from the owner and everything spotlessly clean. Great weekend! First trip to Krakow, we thought the location was perfect. It was so cold and snowy outside, just what we wanted, but it was cosy and warm inside this apartment. It was spotlessly clean. The booking went really smoothly, it was just perfect. We truly enjoyed our stay. 2-3 blocks from Old Town and a block from the river. Also very close to places to eat and stores for food. Highly highly recommend this apartment. I stayed at this property with two friends when we visited Krakow. We made an amazing choice! This apartment looks exactly as it appears in the photos. It is perfectly situated for visiting everywhere in Krakow, literally around the corner from the main square, just a few minutes walk. It is beautifully maintained, extremely comfortable and Dorota was exceptionally helpful from the time of the booking inquiry through to the day we left. She helped make the visit the most wonderful experience. If you're looking for somewhere to stay in Krakow, look no further!